September | 2016 | Errols Weekly Music Update. Maybe Paul Stanley has it right by saying that the entity of KISS will “carry on wayward” with a new “son” taking their places when they are no longer able to front the “hottest band in the world.” He has said many times he wants what he and the other three original members created a long time ago with their love, blood, sweat & tears to live on in infamy with “replacements” who also must be engulfed in the passion of what has been constructed while breathing life into the next generation of the band so that the established fan base will continue to add to its members while treasuring the tradition of that KISS sound. Instead of being upset on who is not in the lineup maybe we should all focus our attention on how this band continues to move forward while maintaining the hunger of its craft. And KISS is not the only band that continues on with new members (but seem to catch the most grief) there are plenty of others who continue on the tradition of their sound- Allman Brothers and Metallica- to name a few. And then there is the band called Kansas. Kansas to the general public has and most likely will always be recognized by their two greatest hits–“Carry On” and “Dust in the Wind’—and those songs will always remain as legendary and revered as they are now. But for the Kansas brethren, time changes with brilliant musicianship along with powerful vocals, classic melodies are part of the reason this band will always be considered as one of the leaders of what is often referred to as the progressive genre. Personally I am not concerned with “labels,” it always has and will always be about the music for me. And oh my Kansas makes music which takes you on a joyous magical journey which is now in its fifth decade. Recently the band added Mr. Ronnie Platt as vocalist after the legendary Steve Walsh retired from the band in 2014. Now there is no replacing Mr. Walsh or Kerry Livgren or Robby Steinhardt or Dave Hope, the “original” recipe of the band which still also includes two original members, Phil Ehart and Rich Williams. No one expects Mr. Platt to live up to the bar that Mr. Walsh set as he has to be considered one of the all-time great vocalists ever. (And by the way Mr. Steinhardt was no slouch on vocals as well and in my opinion doesn’t get the full credit he deserves as a singer, we all know the accolades he receives as musician, specifically his violin play). Over the past 18 months I have seen Kansas live four times in N.Y. and Connecticut and I will tell you the Mr. Platt puts the needed passion and respect that is expected from all Kansas fans into his performances. This guy has “it” which comes shining through as he looks like he is having the time of his life being on stage with the music of his life- which is Kansas- just like it is for us fans. 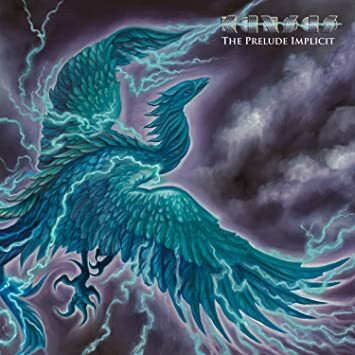 And now he has created new Kansas music (the Sept. 23 2016 release of “The Prelude Implicit”) which in my opinion ranks up there as one of their best albums without the “original ingredients” and dare I say one of their best efforts ever. This Kansas dish also includes a new ingredient (new to the fan base but not to the current members of the band)- Mr. Zak Rizvi- who in my opinion has contributed greatly to the original flare of what we came to love but also has added a spice which has made this legendary band sound fresh with “current” structures which explode into your headphones and you’re sitting there saying- “this is the best album of 2016 period! !” This album has everything a Kansas fan is looking for—you want a majestic epic, it’s there- see “The Voyage of Eight Eighteen”- or how about a microcosm of everything Kansas -see “Summer.” There are 10 new songs which will leave you pleading for more as you won’t believe how stunningly good this album is. Now it has to be mentioned that two gentlemen who also love the music of Kansas and have greatly contributed to its success and they are Mr. Billy Greer (joined in the mid 1980’s) and Mr. David Ragsdale (joined in 1991). They both keep the spirit of Kansas alive and keep the blood flowing with their stupendous musicianship- which again is what makes Kansas so great. Their work on ‘Prelude’ is also something to behold- Mr. Ragsdale violin playing will have you drifting off into another world, the same world which Robby took you. Another recent addition, Mr. David Manion will blow you away with his keyboard acumen. And then what I would refer to as the “power” section of the band- Mr. Williams guitar playing along with Mr. Rizvi will knock you off your feet. And what else can be said of Mr. Ehart? His drumming skills are unreal and he has always known when to make that exclamation point or when to sound like a note- how many drummers play a “note?”- Phil does!! Normally I would go through each song one by one and describe what it means to me but in this review, I will say that every new song on this album is fantastic—I could go on and on about it. One thing to reflect on when you purchase this album- track #9- ‘Crowded Isolation’ could arguably be the “best” song on the album and it is ninth!! Are you kidding me? I want to thank the current members of Kansas for taking me back home to the new future of this legendary band and rekindling the love I have for their music. I have the best times when I see them live and I for one would not be disappointed if when I see them the next time they performed this album in its entirety—there are no fillers here. I can’t stop listening to it.